Part of our Comfy line, your dog will look sweet wearing these tube scarves, rolls on each end. All cotton. Preshrunk. Limited quantity in blueberry and cranberry. As I was working on “My favorite sweater,” I also wanted to provide a tube scarf. I was inspired by the fleece tube I used to wear eons ago. This candy cane design has been available for years, and now we offer new colors with more on the way. CLEARANCE! 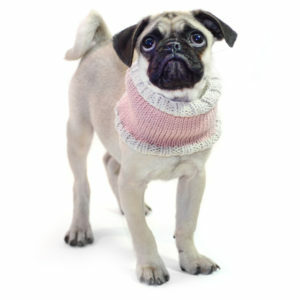 Your dog will look sharp wearing this classic scarf, rolls on each end. Only two smalls left. ON SALE FOR A LIMITED TIME! Part of our Happy Camper line, your dog will look stylish in these fun and functional scarves. Reversible. Pocket for poop bags on one side. Years ago, I sat at my sewing machine and came up with a reversible tube with a pocket that I wanted to sell. My german shorthaired pointer wore it for so long, and then it was stored in a drawer for years. I loved the design and wanted to bring it back into production with a selection of different patterns and colors. Limited quantity! 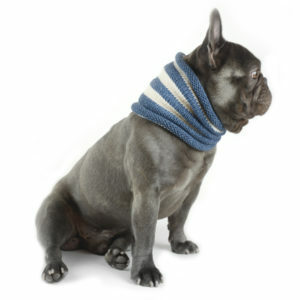 Part of our Comfy line, your dog will look sharp wearing this classy ribbed scarf...or wear it as a headband yourself!